From time to time, we check out Sonic merchandise, rare and obscure, making the auction rounds on EBay. 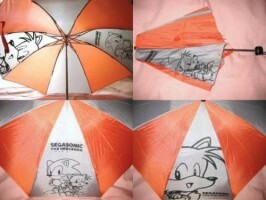 What you see here is a fairly unique and useful bit from Japan: A Sonic branded folding umbrella. One would expect it to be blue, instead it’s an almost Tails shade of orange, with artwork of Sonic and Tails one one side, and the two tailed fox solo on the other. Those interested should have some extra cash on hand; this is a Buy it Now auction, and the Ichikawashi based seller is asking for $255, plus shipping. If only money rained from the heavens…then again, if it did, you probably wouldn’t need this as anything other than a novelty.